Observations on how to instruct and teach fly casting lessons have been a passion of mine for many decades. 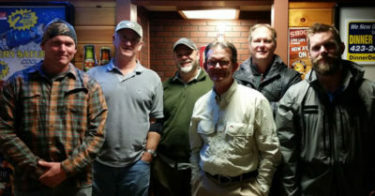 A group of four Master Fly Casting Instructors and two Certified Instructors met at the campus of Lee University to conduct a modality study on teaching fly casting. Eric Cook, Tom Rueping, David Lambert, Guy DeLoach, Mac Brown, and Brian DeLoach were the instructors for the study. The full article is in The Loop Fall 2016 edition. The Loop is a publication by Fly Fishers International. 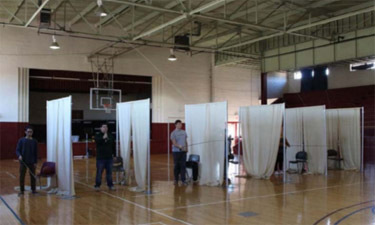 Over 60 college-aged students participated in the study for effective methods of teaching fly casting. 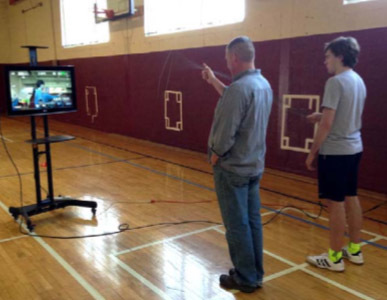 All of the students establish a baseline of casting at targets before being taught with only one of five methods. The methods include reading literature (text), experienced instructor hands-on approach (tactile), verbal instruction (auditory), visual instruction (only visual aids), and the combo of audio and visual combined. The notes for the baseline students before instruction included loop formation, acceleration, timing, rod arc, and three attempts at accuracy targets. All participants test again after the instruction of only one method listed below. The groups that read only a few pages on fly casting actually performed much worse than having no instruction! These results are in graph located at bottom of the page. This irony goes hand in hand with the old saying “you can’t learn fly casting from a book”! The “feel” aspect and serendipity learning about the results of your actions to the fly line is a necessity for learning how to fly cast! Books can provide clues for a deeper understanding of how things fit together for your fly casting journey. 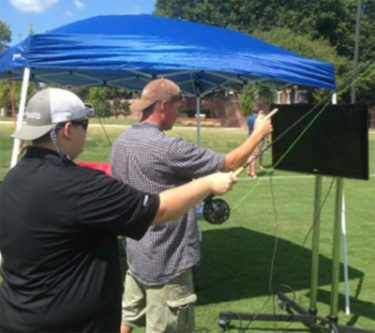 We have all known instructors that believe a “hands-on” approach works for them. 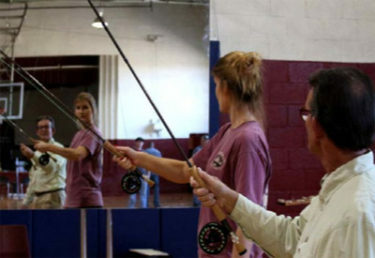 These are probably the same type of instructors that tell the student “let the rod do the work”. This tactile group also performed worse after “tactile” instruction. The curtains in the above pic create a buffer for all of the students. An interesting note is that you could witness the body language of the students in a negative way. Many of them had smiles on their faces until instructors literally forced their hands through the stroke. For new students, this is almost always a disastrous teaching method. As fly casting instructors it really helps to know a bit about your group as such what hobbies or other interests do they have? I performed the auditory groups on both occasions of testing. As an instructor, we have to connect with folks from all walks of life. Three of my six students were texting on their cell phones before I started. That was my opening for auditory teaching. Mel Kreiger helped to write about pantomime methods for teaching. During the ten minutes of instruction, I had all of them pantomime the fly casting motion with only their hand. I used the action of answering a cell phone. Three of the students hit perfect scores at targets with only 10 minutes of pantomime! My friend Christopher Rownes has some classic Mel notes on teaching on his website. The visual group was exposed only to watching a video or an experienced instructor perform casts. Then they would try to mimic what they witnessed. This group receives no audio feedback. Marginal results at best because without feedback there is no need for folks that teach full time! These days, loads of folks think they will learn complicated processes from a YouTube video. There will always be demand for keen instructors that can diagnose and provide direct feedback! The combo groups did show great improvement because direct feedback with visual aids gets results! One of the best two teaching aids during the entire study was the use of a mirror and video monitor with an experienced instructor. The results were instantaneous because of the added visual aid from a different perspective! I had used video for lessons over the past decade and this solidified the concept for me because of the results at Lee University! The direct audio feedback for diagnosing casting faults can be witnessed on video just as well as standing next to the student. 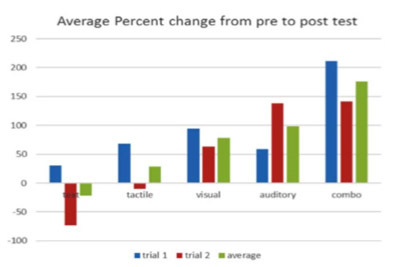 The graph demonstrates the “before and after instruction” results hence, the blue bars represent fly casting before any methods of teaching. The red bars represent after 10 minutes of instruction. It is my sincere hope that something in the study inspires you to perfect your method of connection with the student for a higher level learning to teach! Teaching kinesthetic motor skill sports offers a unique opportunity for the instructor to be an effective communicator. These results are applicable to many other sports such as golf, tennis, etc… because all kinesthetic motor skills have a modality method of teaching which can be most influential for learning. Observations on how to instruct and teach fly casting lessons provide a passionate journey for teachers as well as the student.